What are you going to fill these cookies with? 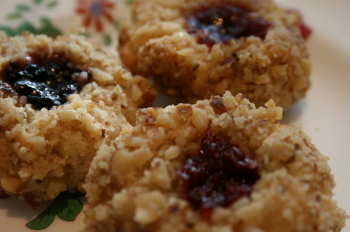 Thumbprint cookies are a shaped cookie and you fill with your choice of a yummy center. You press your thumb into the middle when they are halfway thru baking. Makes a great treat with for the holidays, tea party, or just because. Cream together sugar, butter, egg yolk and vanilla. Pour in salt and flour and blended well. Roll cookie dough into 1 inch balls then dip into beaten egg whites. Followed by rolling into nuts and place 1 1/2 apart onto a ungreased baking sheet. Bake for 6 minutes. Quickly with thumb press thumb in the center of each cookie. Then put in you favorite jam then return to oven and bake for another 7 minutes. Tip: Instead of using your thumb and pressing down in the center. Try instead in the thumbprint cookie the end of a wood spoon thats about 1/2 inch round. Do you have a yummy recipe to share? Submit one!! To be feature on this website.